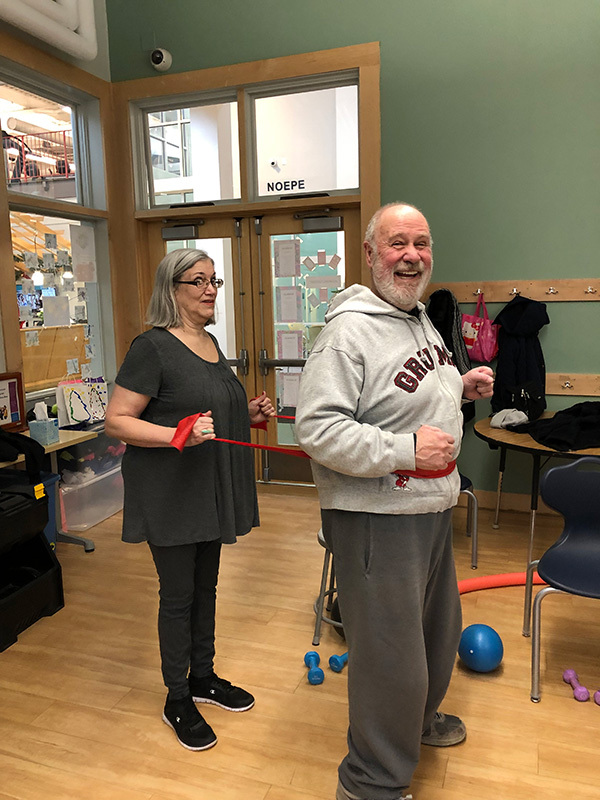 2019 YMCA initiative offered to Island seniors. 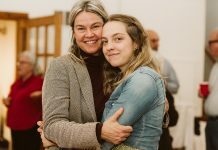 “Successful aging” is a term academics have begun using to describe a healthy aging lifestyle. The YMCA Martha’s Vineyard recently launched a program centered around this term, targeting Island seniors. The YMCA Healthy Aging Initiative integrates exercise, rehab, social engagement, and community involvement to engage the Island’s aging demographic. Betty Robie, a silver-haired trainer herself, brought this initiative to the Y on Martha’s Vineyard. 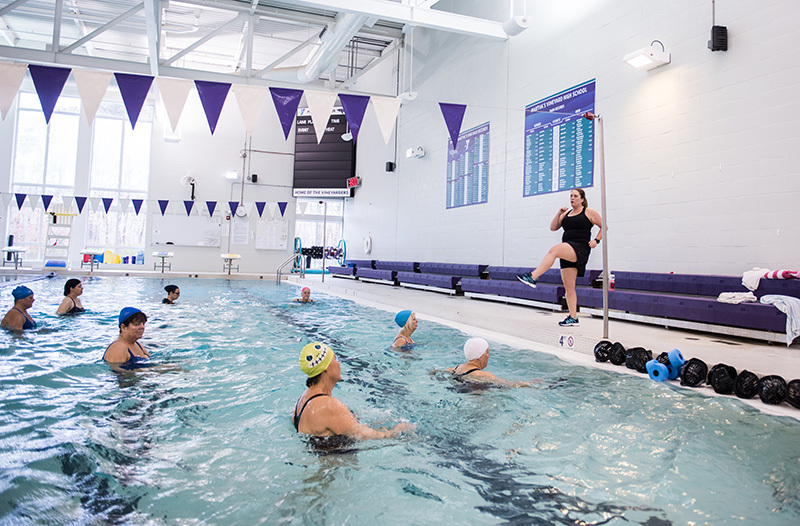 Because the scope is so broad, Healthy Aging programs can be seen in just about every corner of the Y building — the pool, the gym, meeting rooms small and large, as well as in the Y cafe. The information needed to age in the healthiest way possible is vast, and the Y relies on a range of experts drawn from its own staff, as well as from the outside community. Folks who exercise regularly as they age tend to be happier, healthier, and suffer less chronic pain than do their sedentary colleagues, according to somewhat subjective studies from the past, before observational science was available. Now, we have objective, science-based studies, including functional MRIs — which are a window into the brain at work. Such scans show that this three-pound organ actually changes when individuals are engaged in healthy behaviors such as exercise, intellectual engagement, social interaction, and even yoga and meditation, according to Robie. In addition to dozens of regularly scheduled classes appropriate for Healthy Agers, numerous special events are offered each month to provide new skills and knowledge. Themed months, for example, offer more opportunities to learn. National Nutrition Month starts this March. April will focus on arthritis, and May will be Senior Fitness Month. Orthopedic surgeries — you know, those new knees and hips — are a reality for Healthy Agers. 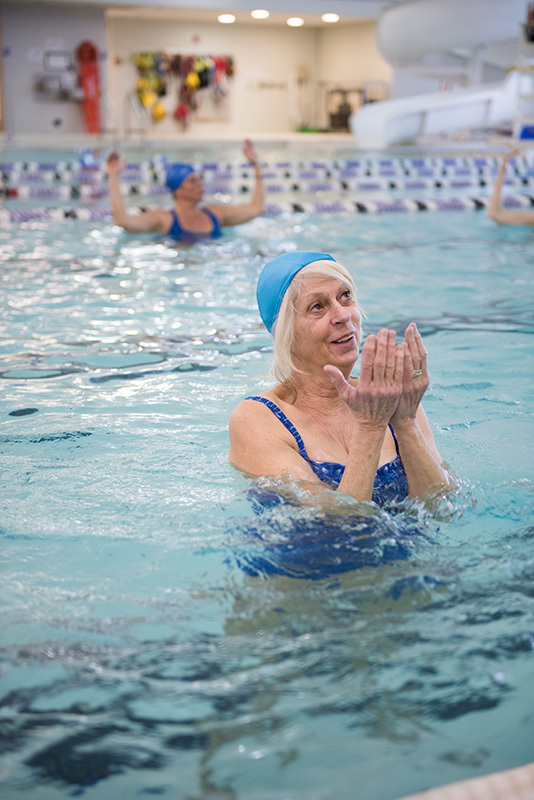 The Y is proud to offer Rehab in the Water. 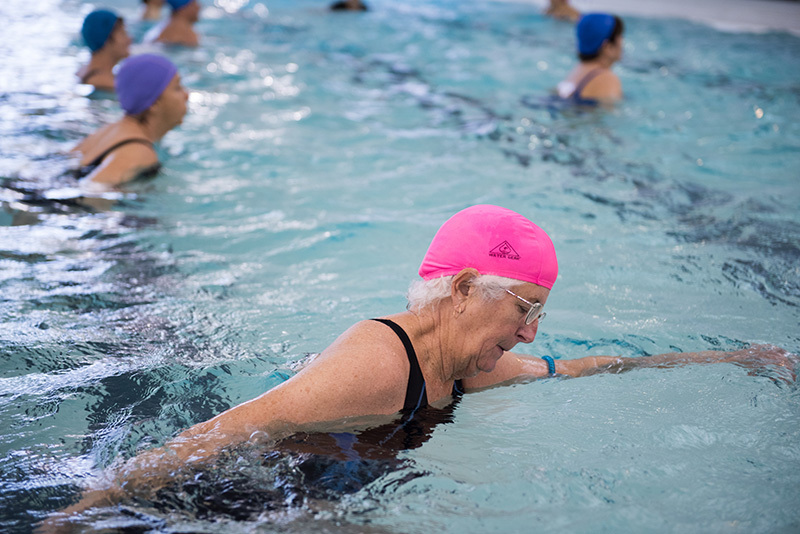 Leslie Craven has been guiding post-surgical patients through the first painful weeks of recovery for over a decade with her water aerobics classes. “Once your surgical wounds heal, water should be the first arena for the post-surgery person,” Craven said in an interview with The Times. “Water is the safest place to rehab. With almost zero impact, reinjury is unlikely. Water reduces pain. Due to hydrostatic pressure. water reduces edema or swelling. Water enables a person to have greater range of mobility because it supports the limb. Most physical therapy exercises can be done in the water.” Craven said she’s had post-surgical individuals come to her weeping in pain. Weeks later, they exit the pool having shed both the walker and the pain. The new Healthy Aging at the Y program has attracted wide support from the Island community. 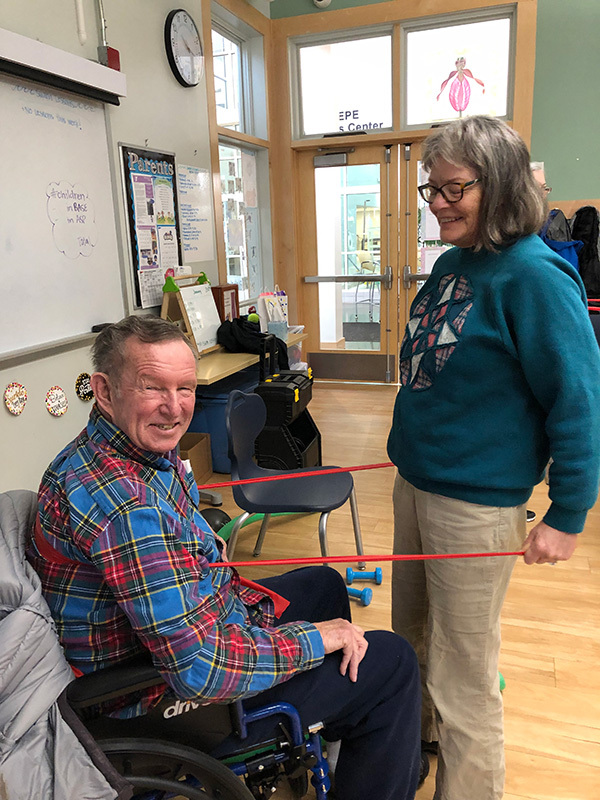 Island Elderly Housing (IEH) sponsored an early pilot program last year where a Y trainer came to IEH’s Woodside Village campus twice a week to introduce the Sit 2B Fit classes, a chair exercise program. Now IEH provides transportation to the Y for tenants lured into chair exercise. One IEH tenant claims she is “walking better and breathing better” since she became a Y exerciser. Dr. Michael Jacobs, a now retired longtime Vineyard practitioner, is actively organizing other Island physicians for an upcoming panel titled, “I’m healthy and fit, how do I stay that way without injury?” The Y is coordinating with Island Councils on Aging in areas of common interest. 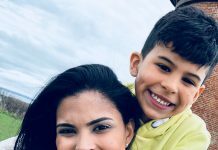 The Y is also working with the Martha’s Vineyard Hospital, and will soon launch health education talks via Skype with specialists at Massachusetts General Hospital. 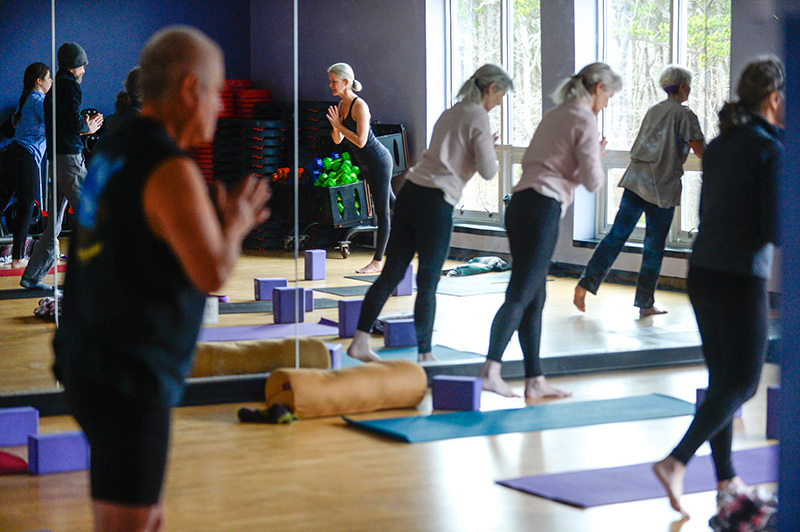 Demographics show the Island to be ripe for programs such as Healthy Aging at the Y. The number of elders on the Island is growing at a rate disproportionately larger than in other geographic areas, according to a study from the Donahue Institute at the University of Massachusetts. The study projects a dramatic increase in the Island’s senior population over the next few years. in 2010, one in six Islanders was over 65, but by 2030, that number is expected double to one in three. Oak Bluffs selectman Gail Barmakian claims her town has the highest percentage of seniors of any community in the commonwealth. How do I become a Healthy Ager at the Y? ymcamv.org/healthy-agers. This chart lists over 50 classes appropriate for the 62-and-above crowd, and is color-coded to reflect appropriateness for four different levels of personal fitness. Try a class, and when you are ready, join. Don’t let money stop you. Ask for a simple financial assistance application at the Y front desk. Feb. 5 and 7: 12 to 1 pm, TRX workshop in the Y gym, registration required. TRX was invented by a Navy SEAL, and is a form of suspension training that uses body-weight exercises to develop strength, flexibility, and core simultaneously. Feb. 14: Massachusetts General cardiologist Skype program. Call 508-696-7171, ext. 0, to confirm. Feb. 15: 12:30 pm, Broadway Dance Workshop with Judy Kranz, Y Pilates teacher and former Broadway dancer. Feb. 21: 10:30-11:30 am, For Men Only. Y members who exercise regularly and are committed to the lifestyle change they enjoy will be joined by several male fitness instructors. Unique-to-men tips on keeping fit will be discussed.